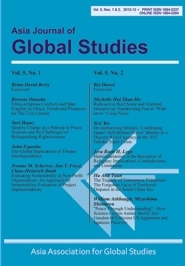 Published twice yearly, the Asia Journal of Global Studies (AJGS) is the official journal of the Asia Association for Global Studies (AAGS). The journal features research articles on Asia and other world regions from an Asian perspective. AJGS' other regular offerings include guest columns by global studies experts in Asia, reader commentaries, and book reviews. Multidisciplinary in scope, AJGS accepts contributions from authors with backgrounds in the humanities and social sciences. The journal encourages historians, political scientists, sociologists, anthropologists, linguists, philosophers and others to submit their work for consideration. It particularly welcomes research that dissolves academic boundaries, looks beyond traditional notions of the nation state, and aims for a holistic view of the past, present and future. All submissions to AJGS are peer reviewed and judged for their originality, quality of writing and relevance for AJGS' overall objectives.